UK National KO Cup Champions! The Victorious Team ...... With Cup! Following the success of Newport Cricket Club’s U15 Girls (UK Runners Up) and U13 Girls (UK Winners), Newport Cricket Club’s Women’s Cricketers completed a unique ‘treble’, when they won the ECB UK Women’s Club Championship, by beating Finchley Gunns at the ECB Women’s UK Premier League Finals Weekend, where they faced stiff competition from some of the best Women cricketers in the Country. 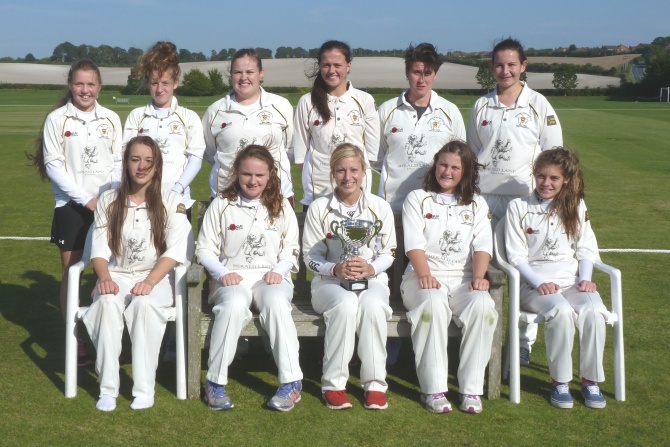 Fresh from the success of the club’s younger girls, having won the ECB Women’s South & West League, Newport headed to the ECB Women’s National Knockout Cup Final Weekend in buoyant mood. Held over 2 days, Newport faced ECB North League Winners New Farnley (Leeds) in the Semi Final at Luton Town Cricket Club. Bowling first, the Newport opening bowlers were quickly into their stride with Ffion Wynne and Becky Struthers both claiming early wickets as New Farnley slipped to 29-3. However, with the important wicket of Holly Armitage, LBW to Claire Thomas for 11, New Farnley crumbled to 65-7, before a ninth wicket partnership of 27 between C. Frampton 19 and S. Robinson 9, took them to 99-9 from their allotted 40 overs. All of the Newport bowlers bowled well, with Captain Claire Thomas 3-8 and Ffion Wynne 3-16, being the main wicket takers. In reply, Newport got off to a disastrous start slumping to 12-3 against left arm swing bowler Suzanne White (3-20). But once again Captain Claire Thomas led the fight back and a 4th wicket partnership of 30, put Newport back in the game at 42-3. However, with the loss of Thomas (13) and Gaby Basketer (25), Newport found themselves in deep trouble at 66-6. The pressure was rising on the young Newport team and when Becky Struthers was out for 12, with the score on 81-8 it seemed that the dream of a place in the UK Final was slipping away. However, seventeen year old Ffion Wynne (16not out) and fifteen year old Nicole Reid (7not out) had other ideas, calmly guiding the team to a 2 wicket victory at 100-8, with an unbroken 9th wicket partnership of 19. As winners, Newport were now scheduled to meet ECB South League Winners Finchley Gunns in the Final at Dunstable on Sunday. The strong Finchley side, which included Beth Morgan (ex-England) and several England Academy players started as overwhelming favourites against the young Newport team consisting of seven U17 players. But batting first, Finchley were in immediate trouble at 10-2, with opening bowlers Struthers and Wynne claiming the important wickets of openers H. Stolle (6) and N. Miles (0). Beth Morgan, with the experience of 72 England Women’s ODI Internationals to call on, steadied the innings and in a quick 31 run partnership with C. Dalton the innings looked in good order at 41-2, before Dalton was bowled by off spinner, Claire Thomas for 11. 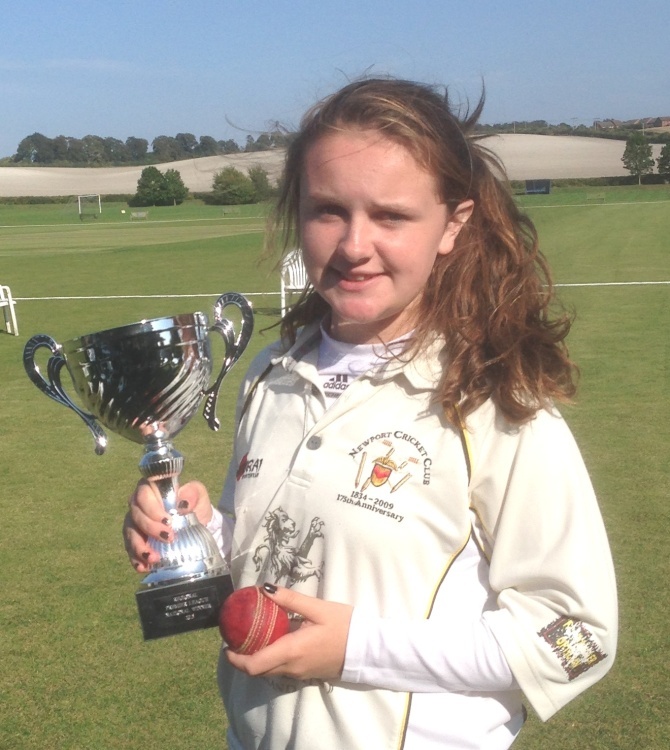 Immediately afterwards, the game was turned on its head with the prize wicket of Beth Morgan, stumped by fourteen year old Georgia Parfitt off the bowling of fifteen year old Nicole Reid, for 23 and the score 41-4. Thomas 7 overs, 2 maidens, 2 wickets for 10 runs. back and at 43-3 Newport appeared to be cruising to a comfortable victory. (6 not out) batting with maturity beyond their years, guided Newport to a 5 wicket victory at 64-5. Captain, Claire Thomas Cracks Open The Bubbly! cricket club in the UK’. Visit the Gallery Page for more photo's.